For over six thousand years, people have been living at the confluence of the Red and Assiniboine rivers. Hop aboard our Heart of a Nation City Tour, and we guarantee you will never see this community—today called Winnipeg—in the same way again! Visit the city’s charming French quarter, St. Boniface, and the gravestone of Louis Riel, our province’s Father of Confederation. Venture into the Exchange District Historic Site of Canada, a popular filming location for a number of major motion pictures, where you’ll find the largest collection of turn-of-the-century architecture in North America. See the MTS Centre, home of the NHL’s Winnipeg Jets, and the community club where music legends The Guess Who and Neil Young got their start. Pass through Osborne Village—voted Canada’s greatest neighbourhood in 2012—view the stately mansions on Wellington Crescent, and enjoy the grandeur of Assiniboine Park. Marvel at the world’s only human rights museum; a 16th-century Venetian merchant’s palace; and one of Canada’s most mysterious architectural wonders, the Manitoba Legislature. For 90 minutes, our knowledgeable guide will help you experience the very best sights and stories the River City has to offer, on Winnipeg’s only public sightseeing tour. Learn why Manitoba’s capital was once called the ‘wickedest city in Canada’, how a local hockey team became the world’s first Olympic hockey champions, Winnipeg’s shocking connection to the world’s most famous spy—James Bond—and much, much more. 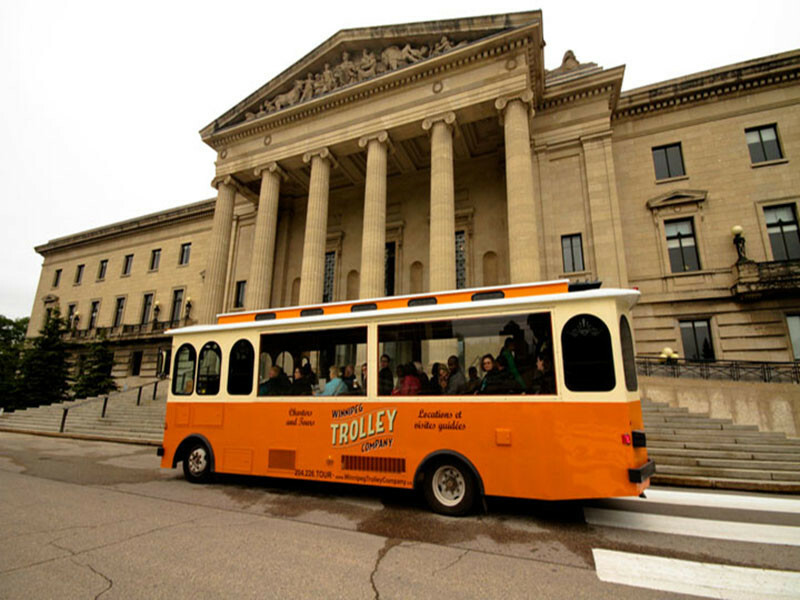 This tour is humorous, engaging, and as ‘the best first thing to do in Winnipeg’, will help you discover what makes the city at the heart of the country so special!